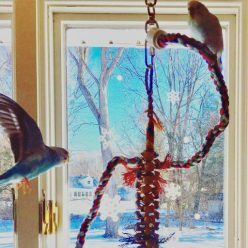 Usually when you install a new bird toy in your budgie’s cage you might expect some trepidation, that was not the case with Super Bird Creations Wind Chimes Toy for Birds , which was immediately a favorite of both Toby and Kelly. I would also typically recommend leaving a toy in the cage for no more than one month before rotating, but both parakeets play with this every single day, sometimes the bulk of their play time is devoted to this single toy, so it’s been in our cage for several months now, and as you can see it still looks great. It’s really more than one toy, you’ve got shoelaces for soft chewing and harder plastic straws for attempted destruction. Beyond that, you’ve got an awesome wood ball to perch on at the top, and if you make all the way to the center of the straws there’s a secret bell inside! It is seriously multi-colored, but nothing so vibrant that it scares Toby, who tends to be put off by reds and oranges. For parronts the best part of this toy is that it reduces a lot of play time fighting, it’s so tall that they can play at two levels without even seeing each other, or even just on opposites sides. Also they each love taking one single straw aside and dominating it or taking some time to preen. I was worried initially that the plastic straws wouldn’t hold up very well to chewing, and I bet larger parrots would make short work of this toy, but it’s perfect for budgie-strength. As I would recommend with all toys, you should wipe it down regularly and take it out to inspect for any damage that could hurt your parakeet. I have trimmed some of the straws where they started to come apart a bit, I really don’t want them accidentally eating the plastic. Overall though not much maintenance has been needed, and I think that even if I had to remove some of the straw pieces entirely this would still be a ‘keet favorite. They really seem to enjoy toys with parts they can move around and control. At the time of this writing this toy is $12.49 and it’s available on Amazon Prime, so if your parakeets are begging for a new toy I can’t think of a better one to try. Might have to give this a try with our guys. 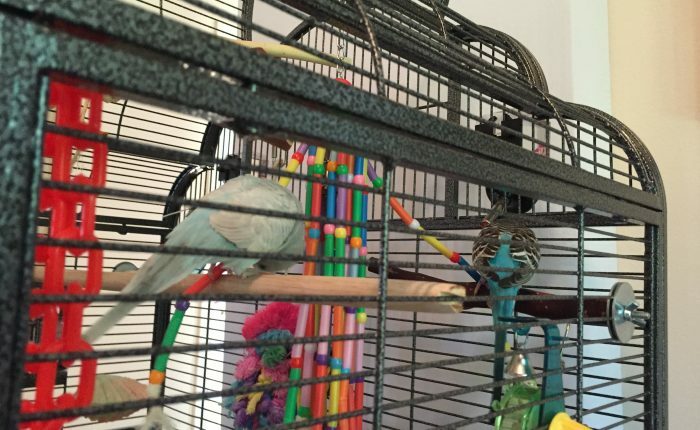 Interestingly enough, we also noticed our budgies dislike the color red. That’s very interesting! I wonder if at some point a distaste for the color red saved budgies’ lives in the wild. That would have been bad news for my younger budgie since he doesn’t mind it one bit!